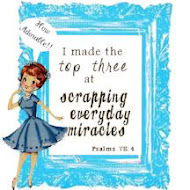 IF YOU ARE HERE FOR THE SCRAPPING EVERYDAY MIRACLES INSPIRATION WEEK DAY 2, PLEASE CLICK HERE!! Hey Gals, and welcome to another day of home decor projects here on my blog!! Today I have such a cute project to share with you!! Once again, I found this cutie on Pinterest . . . what would we do without Pinterest!!!!! I made some 3D snowflakes with words on them that reminds me what Christmas is all about! The snowflakes look real easy to make . . . and they is . . . but they take a little time, and if you use your Exacto knife to cut them, they are very hard on your hand!! Here is my version of the snowflakes!! To take pictures of them for my blog I've hung them on my living room wall, but I don't think the white wall is doing them justice! I've moved them to the living room window, but once again the light is terrible to take decent pictures. Here are a few close-up pictures of them. I did not take picture of them as I was making them, but you can go to Jessica's wonderful blog for a GREAT TUTORIAL on how to make them!! Thank you Jessica for the inspiration!!!! 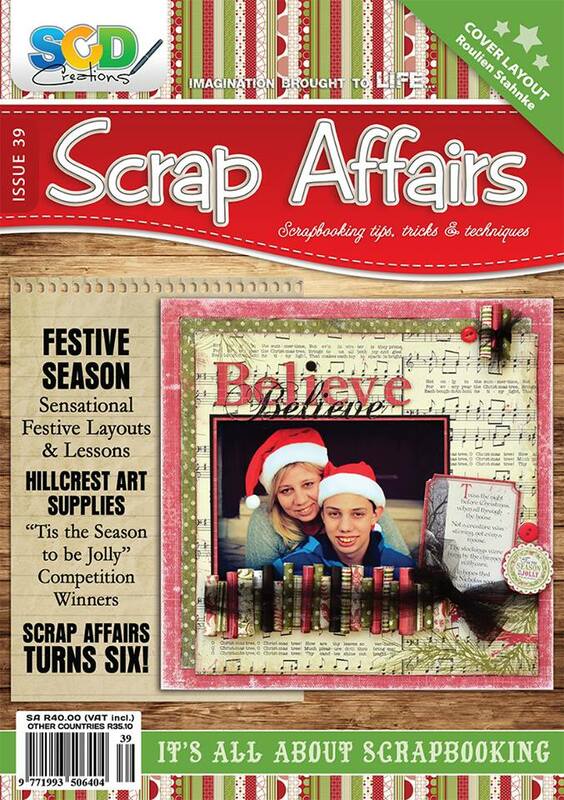 Have you stopped by the Scrapping Everyday Miracles blog today for some more Christmas Inspirational projects?? Please do, and leave the girls some love, you can win some awesome prizes!!! Have a great day . . . and see you tomorrow!!! Welcome to a Week of Christmas Inspiration! 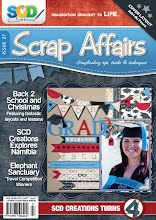 Welcome to the Scrapping Everyday Miracles week of Christmas Inspiration! This is going to be one FUN week, filled with everything "chrismassy"!!! 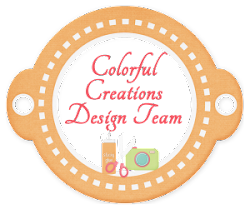 Everyday one of the DT ladies will be showing of a Christmas project on the Scrapping Everyday Miracles blog, and then they will direct you to their personal blogs for a more in-dept look at the project they've created. There are also lots of wonderful prizes from our very generous sponsors, which you would not want to miss!! 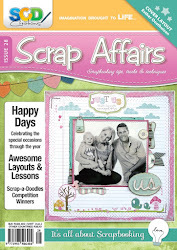 Head on over to the Scrapping Everyday Miracles . . . and let the fun begins!!!!! My turn on the SEM blog will be tomorrow, Tuesday 29 November, but I've decided to do a week of home decor projects!!! Since Christmas is not a recognized holiday here in Saudi Arabia, finding a variety of christmas decorations and ornaments is very hard and very expensive. And since we will fly to South Africa just before Christmas, I didn't want to spent a fortune on store bought decorations. But I wanted to make our home FEEL like christmas, I wanted to have a tree with ornaments and all the good stuff!! And thanks to Pinterest, where I found loads of fun projects to do, I decided to make our decorations and ornaments this year! I was surpised at how easy and how much fun I had in doing this!! Even my DH helped me with some of these projects!! Today, I want to show you one of the easiest things you could make! I found these lovely christmas lanterns/balls on Pinterest, and just had to try them out. Unfortunately, I didn't pin it to my boards, and now I can't find it again on Pinterest!!! 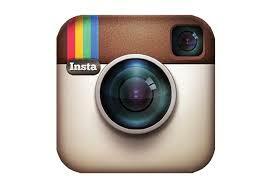 I've someone can help me to give credit where credit is due, I would really appreciate it! Here is how you make this cuties!! * Cut 15 strips of paper in .5" width and 4" long. Do not use paper that are very thick!!! Stack your paper strips on top each other. * Use a small punch or your paper piercer and make a small hole on each side (about 1/8") from the edges of each paper strip. * Put a small brad throught each hole. * From the bottom of the stack, twist the paper strips out to form a ball. Very easy to make, but they look so cute!! I've placed mine in a glass bowl and they looks so pretty!! 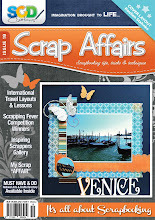 Tomorrow, I'll have another fun & easy project to share with you!!! If you make one of these, please leave me a message with a link to your project . . . I would love to see your creations. And at the end of the week, I might just have a little surprise for someone!! Yes, this one will be VERY Random!!!!! First off, HAPPY THANKSGIVING to all of you celebrating!!!! Wishing all of you a wonderful day with loved one's!!! Our compound is having a Thanksgiving potluck dinner tonight . . . I'm really looking forward to this!!!! 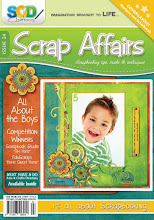 This week the new Let's Scrap Design Team has been announced . . . AND I MADE IT!!! 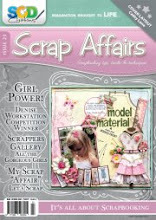 This will be my 4th time with the Let's Scrap girl, and I can't wait!!! These wonderful ladies are so talented and friendly and encouraging!!! 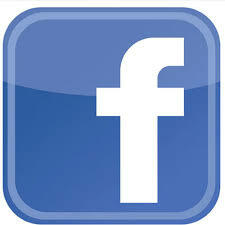 I've made a ton of on-line friends from this site. If you love double page sketches, then you have to check out Let's Scrap . . . but be warned . . . the site is addictive, people!!!! Once you get on there, you can't get off!!! 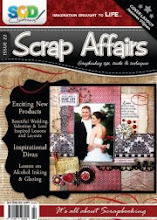 I'm really busy getting everything ready for next week's Inspiration week on the Scrapping Everyday Miracles blog. The design team ladies really has put so much work into this blog hop to make it a fun week filled with Chirstmas Inspiration. We have ideas for decor, cards, presents and much, much more!!! Lots of prizes from the main blog and the DT ladies personal blog!! I'm working really hard to bring you 7 days of home decor ideas!! Fun and easy projects to make your home feel like Christmas without braking the bank!!! If you have paper and a few tools, then you will be able to make these project!!! I can't wait to get started!!! 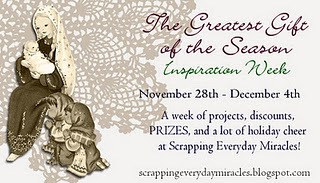 If you are looking for Christmas Inspiration be sure to check out the Scrapping Everyday Miracles blog from November 28th to December 4th. The amazing DT will have some wonderful Christmas projects to share with you. Along with the inspiration there will be lots of A-M-A-Z-I-N-G prizes up for grabs!! WE CAN'T WAIT TO START!!! So, I had this shadow box lying in my cupboard for such a long time that I had to dust it off before I could use it!! How sad is that!! 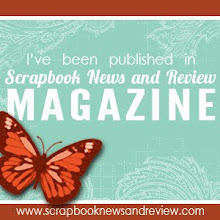 With the dusted shadow box and Kaiser Craft's new Bonjour line of papers in hand, I knew I had a winning combination!! I found the quote a few weeks back on Pinterest and immidiately LOVED it!! Combine together the products made one beautiful project!!!!! 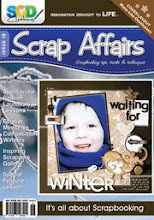 Today we start a new challenge @ Scrapping Everyday Miracles! 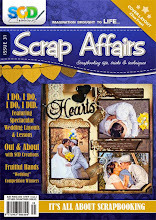 Lisa is hosting the challenge and here is what she challenge you to create!! "CHALLENGE #10: Nothing speaks of God's miracles and blessing more than nature. God created a world full of wonders and they are all around us. In the Bible Jesus says that if the people stop singing God's praises even the rocks will cry out… Luke 19:40 (NIV) "I tell you," he replied, "if they keep quiet, the stones will cry out." Your challenge is to find His miracles in the natural world and what they mean to you. It could be through a beautiful landscape or the amazing intricacy of a flower. Open your eyes and camera to the created world around us. You may be surprised at what you find! 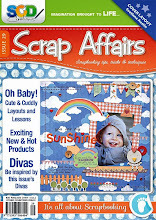 Scrap Twist – Re-purpose something to use as part of your layout. It could be a piece of vintage ephemera or an ad from your junk-mail. Or parts of packaging or other "non-scrapbooking" supplies. Get creative! 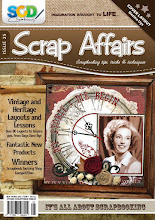 Please create a layout or project that deals with nature and uses the scrapping twist of re-purposed stuff. Link your project here by November 25th for a chance to win a $10 Gift Certificate to Design by Diana or a guest DT spot!" I've used a picture from our recent trip to South Africa! We were at a look out point towards the Blyderivier Canyon. And the scenery truly t-o-o-k-m-y-b-r-e-a-t-h-a-w-a-y!!! It's so beautiful from up there and made me feel like I'm on the edge of the world. And it reminded me how Great is our God! He created it all. I can't even get my mind around it . . and He MADE it!! Made me feel small and humble!! We would love for you to play along with us!! 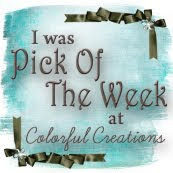 We have a $10 GC up for grabs from Design by Diane and a Guest Design spot for January! Come play with us!!! !